Ion mobility spectrometers are well known devices for detecting trace gases in ambient air, like e.g. an electronic nose. They do this by ionizing the substance, and letting the ions drift with help of electric fields over a certain distance. From the time they take to travel the distance, the mobility can be calculated. These spectrometers are fast, robust, very sensitive and small, but not very selective, i.e. a lot of substances give similar signals when measured with this technique. One approach to improve the selectivity is to increase the resolving power. With help of FEM simulations, many device parameters (i.e. applied voltages, dimensions, shapes) can be tested in order to achieve such improvments. Time of flight mass spectrometers are sensors that analyze substances in gases. They do this by ionizing the substance and letting the ions fly over a certain distance. The time they take to fly the distance allows to calcutale the mass of the substance and thus to help identifying it. Contrary to e.g. ion mobility spectrometers, the ions fly in vacuum, and thus large pumps are needed in order to evacuate the device. Time of flight mass spectrometers can theoretically measure any mass without restrictions, they are fast and very sensitive, but large and heavy, stationary devices. 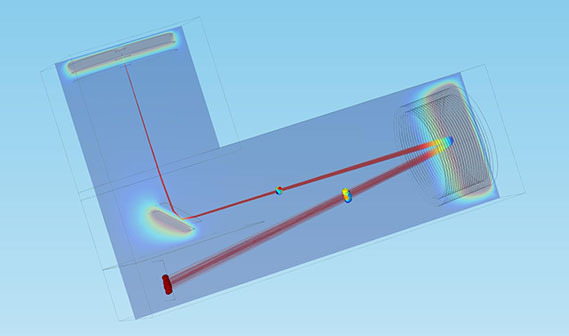 With help of FEM simulations, it is tested how these devices can be reduced in their size without compromising their advantages regarding mass analysis. The goal is to develop portable devices which allow for measurements similar to their large counterparts. A secondary goal is to test and develop new device principles. 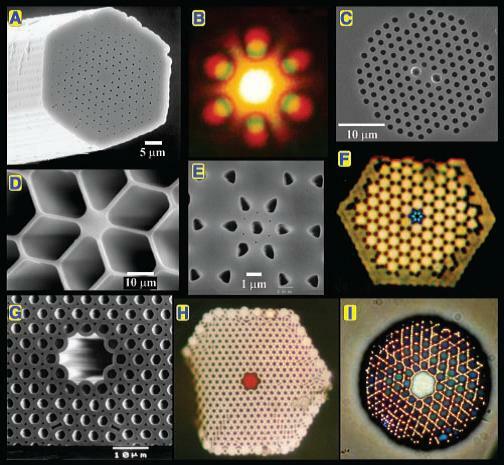 Photonic crystals are regular structures with certain defects (e.g. a regular arrangement of air holes in GaAs, defects are locations where air holes have been left out). Such structures allow light of a certain wavelength to propagate in certain areas, and prohibit such a propagation in other areas. This is similar to semiconductor crystals, where electrons with a certain energy can be thought of being able to travel throughout the whole crystal, and electrons with different energy cannot; the energy ranges are called bands if thy allow the electron to travel, and band gap if they do not. For photons in photonic crystals, these energy ranges are correspondingly also called bands and band gaps. Thus, photonic crystals are good candiates for applications where light has to be guided as in e.g. fibers, but also switches etc. For example, by incorporating materials with strong Kerr-Effect, the guiding behavior can be controlled via the light's intensity. This principle can be used to create optical bi-stability as e.g. in optical flip-flops, and many other applications are possible. The perferomance of these structures depend strongly on their set up (symmetries, materials, etc.). With help of the FEM method, many different parameters can be tested and thus photonic crystal based devices be developed for certain applications such as e.g. low light power optical switching. This project is concerned with the electromagnetic wave propagation in photonic crystal fibers and optical fibers. We are interested in the guided modes of the crystal using different geometries. It is well known that photonic crystals have some advantages related to the losses. Furthermore, they allow interesting effects, e.g. when the light is travelling in an air hole in the center of the fiber (hollow core photonic crystal fibers), thus travelling 30% faster than in glas as in ordinary optical fibers. In photonic crystals the geometric arrangement of the refraction index influences the mode structure in the crystal. A variation of different geometries is shown in the following figure demonstrating the different structures and ways how electromagnetic waves are transmitted in photonic fibers (Ph. Russell, Science, 17, 358, (2003)). The aim of the project is to use an object oriented approach to solve Multi Body System problems. 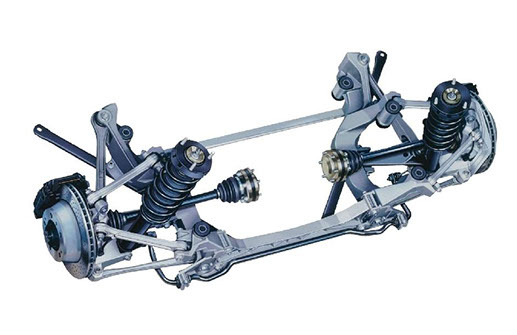 An example of such mechanical systems is the following rear axel suspension used in modern cars. 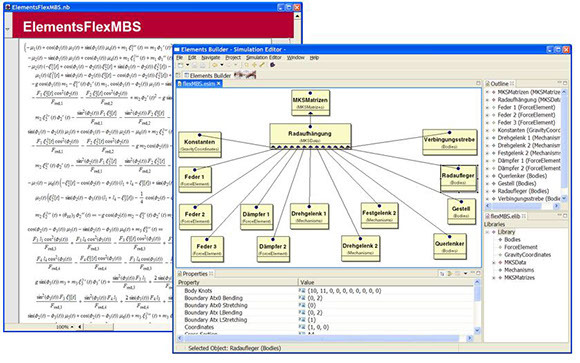 The modeling is based on computer algebra methods in connection with numerical simulations (hybrid computing).